Took our first journey south to Mercury bay. On the way we stopped at a place called Cathedral Cove, which is a beautiful tropical looking bay where the rocks have formed into a cathedral-shaped archway. 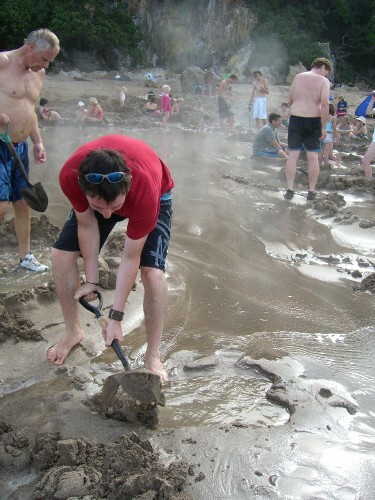 Next we visited the strangest beach - hot water beach....Again its pretty self explainitary but basically everyone hires shovels and you walk down to the beach to a certain area and start digging. 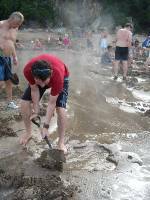 There is a thermal outlet comin up throught he sand and the whole you dig fills with boiling hot water. Like building your own spa pool. It was amazing, and the water really was boiling. It was too hot to lie in, you had to wait for a cool wave to wash in and mix with it. We had a great afternoon digging.